Beckie Littler on being thankful when things go wrong, but also dealing with things before they cause more damage. We have had an interesting time of it recently. First while I was cooking a roast dinner for my family the oven door handle fell off! Not ideal when doing a roast. Then my husband noticed a leak in the kitchen. So we got in touch with our landlord and explained that the house was falling apart and they said they would fix it soon. A week passed and no-one had fixed it. We didn't think the leak was too bad so we left it with them. My husband came home from work and was standing underneath the lights in the dining room when suddenly he started getting wet. There was a leak underneath the bath and it had turned a perfectly good light into a perfectly good shower. This caused all the lights to go off because apparently water and electricity are not a good combination. Who knew? We called the landlord again, but this was 10.30pm, so of course no-one answered the phone. So we put towels and buckets down and we went to bed. The next morning after getting exactly no sleep at all we went to see if the leak had stopped. It had. Except now I had a big damp patch on the ceiling and the lights didn't work. So we called the landlord again and this time they answered. Hallelujah. Someone came out to have a look at the 'small' leak in the kitchen and the leak in the bathroom. Thankfully they managed to fix the bath, but they had to smash the panels to do so and ripped up the flooring, but we were ok with that because at least our biggest issue was resolved. Right? Wrong. The small leak in the kitchen turned out to be the pipe that supplies water to the entire house. So this meant that they had to dig a hole in the kitchen floor to get at the pipe then turn all the water off to the house and then fix the pipe. It took a long time to fix it. Through all of this I was very stressed. Then I rang my mum and she just kept saying that I should thank God. I thought this was weird at first, because why would I thank God when my house just tried to kill my husband?! Then I realised that if the lights hadn't gone off just before the water started pouring, then Matt might have gotten seriously hurt. If the leak in the kitchen had been left unchecked then we could have flooded the house. God had perfect timing in when things got fixed. He had kept us all safe and sent the right people around to fix the problems. This is true in our hearts as well. If there is an issue we have then we try and say that it doesn't bother us, or that it's just a small leak, but if it goes unchecked then those small emotional problems can lead to anxiety and depression. That can cripple you into not wanting to go out or do anything for fear of what could happen. That happened for me. When I lost my son Harry I thought that I was fine. I had my other son and life had carried on. I would get upset every now and then, but I never really thought I needed help or to talk to someone about it. Then the small leak started to flood. I was always upset and had learnt to put on a fake smile for the sake of my family and friends. God knew that I needed help so He sent someone who could make me feel safe enough to talk about it. That someone has remained a part of my life and that person is my husband. God knows what you need and the best thing is you only need to ask for help and God will answer you. I know that because He did it for me. 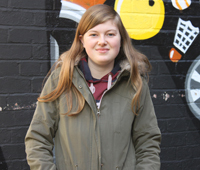 Beckie is a volunteer in her local church, doing many of the under 18's groups. She is a mum to a gorgeous son and enjoys adventure sports and script writing, but her main passion is encouraging young people to be themselves.